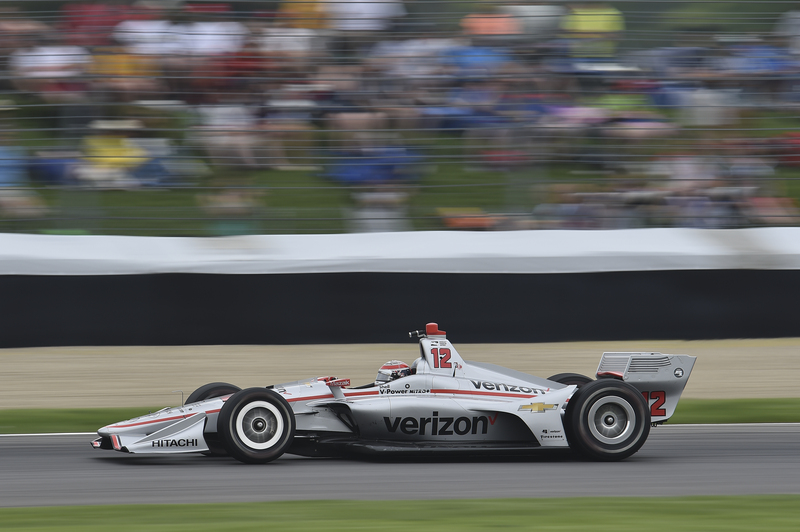 It was a day of milestones for Will Power and Team Penske at the Indianapolis Motor Speedway. Despite challenges from Robert Wickens and Scott Dixon, Power held them all off for his 33rd career victory in Indy car competition and the 200th Indy car victory in the history of Team Penske. The race started with what appeared to be a clean start as the field funneled into Turn One. The first few qualifiers made it through with relative ease, but when Takuma Sato tapped Helio Castroneves in the mid-pack, a chain reaction ended with Simon Pagenaud and Jordan King taking a trip off the tarmac. King stalled his machine in the sand trap to bring out a full course caution while his Ed Carpenter Racing teammate Spencer Pigot would spin on Hulman Boulevard just a few turns later. He hopped the curbing and left the racing surface with all four tires in the air before coming down and getting into Sato slightly. Pigot was assessed a drive-through penalty for his recklessness. The race re-started on lap four and the super rookie Wickens overtook Dale Coyne Racing’s Sebastien Bourdais on the entry to Turn One. As the race progressed, Wickens remained tight to Power’s rear wing when pit stops put the two drivers on alternate strategies. Wickens would grab another set of Firestone red alternate tires while Power switched to the more durable Firestone primary tire at the first set of stops. By lap 26, Wickens had caught Power and passed him for the race lead with a textbook pass. From there, the Canadian driver pulled a quick gap of 3 seconds by lap 28 and by the time he pitted on lap 41, Wickens led the race by 4.9 seconds. The next round of pit stops would make a vital impact on the race, though, as Power went back to the alternate compound while Wickens had to put on the primary tires to meet INDYCAR’s tire use quota. In under ten laps, Power reeled in the rookie and passed him on lap 50 with a well-executed overtake. Similar to Wickens’ pass for the lead earlier, Power pulled a quick gap that continued to grow in the race’s waning moments. While that was going on up front, Bourdais and Josef Newgarden were battling vigorously for 4th place when the defending series champion hit the curbing and spun his No. 1 Team Penske machine. Newgarden would stall his car and bring out a full course yellow before dropping to 21st. In what would be the final round of pit stops, 13 of the top 14 drivers took Firestone alternate red tires, including Power and Wickens who raced to the pit exit line in a dramatic sprint that was separated by inches. Power nipped Wickens to the line and retained the race lead. Shortly after the final restart, Scott Dixon put an exclamation mark on his surprise rise through the field by passing Wickens for the second position. This left Wickens to deal with Alexander Rossi for multiple laps as the duo fought tooth-and-nail over that final spot on the podium. As the race reached its final stages, fuel saving and scattered rain drops threatened Power’s growing lead while the Penske driver remained rock-solid. Closing out a strong performance, Power finished off the day by winning the INDYCAR Grand Prix for the third time. He is the first driver to win the race three times and passed Rick Mears for sole possession of 2nd on the Team Penske Indy car wins list with 30. As previously noted, it was also Roger Penske’s 200th victory in Indy car competition. Dixon finished runner-up by a safe 3-second margin while Wickens wrapped up the podium after holding off a late-charging Bourdais. Rossi was the final member of the top five while Helio Castroneves placed 6th in his return to Verizon IndyCar Series competition. James Hinchcliffe (7th), Simon Pagenaud (8th), Graham Rahal (9th) and Takuma Sato (10th) rounded out the top ten while Newgarden rebounded from that late-race spin to finish 11th. Zachary Claman de Melo placed 12th as a fill-in for Pietro Fittipaldi in Dale Coyne’s No. 19 machine while Marco Andretti finished 13th. Stay tuned to Open-Wheels.com for continued coverage of the INDYCAR Grand Prix and the entire month of May at Indianapolis.